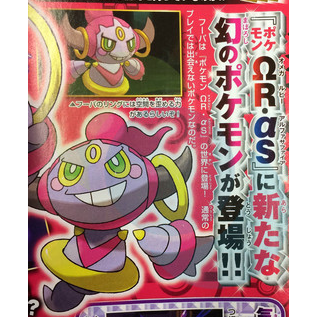 8 Is Hoopa The New Pixie? 13 Confined Hoopa is only a head? 19 STAB for Confined or Unbound? 22 Is this trivia worthy? 24 Generation VII form change? Is Hoopa The New Pixie? This Won't change that the form of this sentence is wrong. It was revealed in January issue that the February issue will have info about it. Confined Hoopa is only a head? STAB for Confined or Unbound? Greetings. The page for Hoopa is protected and hence I cannot make an edit. The Edit is that on the page it is written incorrectly that Prison Bottle and Hoopa Unbound have not been officially revealed. "This page has been locked so that only established users can edit it." Why is this bit of trivia necessary? If the TM Dark Pulse is not on the list of TM moves that Hoopa Unbound can learn, then I would think it would be obvious that it can't learn Dark Pulse by TM. Just because some Pokémon can learn level up moves by TM as well doesn't mean ALL Pokémon are capable of that. Regardless, if the move Dark Pulse is not on the list of TM moves Hoopa Unbound can learn, then one would think it obvious. Therefore, not necessary to point out a bit of trivia that is obvious. This leads me to believe that Hoopa's forms change the same way they did in Generation VI. So how had anyone come to the conclusion that it worked differently? Maybe they were thrown off by the quirky interaction with Hoopa Unbound and the PC? The thing is, it looks like Hoopa Unbound will revert to Hoopa Confined upon retrieval no matter how much time has passed since the Prison Bottle was used (whether it be fewer or more than three days' time). Anyway, I think I figured it out. This should be how the change between forms really works, written as wiki-worthily as I could manage. "Hoopa Unbound will revert into Hoopa Confined if three days have passed after using the Prison Bottle without being deposited in the PC, or if it is deposited in (Generation VI) or withdrawn from (Generation VII) the PC." This page was last edited on 25 March 2017, at 21:34.